It's not too often you'll see a game winning hit from Chone Figgins. Today isn't that day either. 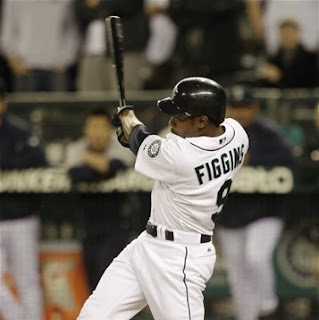 Figgins did win the game, but it was on an out, not a hit. The bottom of the 11th inning, Dustin Ackley on third base and Miguel Olivo on first. Figgins came to the plate and hit a line drive to Cody Ross in right field that was caught. It would have clearly been a hit, but do to the circumstances, Ross was playing really shallow and made the play. Ross gunned the ball to the plate as Ackley was sliding in. In almost a mirror of Thursday night's game, Jarrod Saltalamacchia missed the short hop and Ackley was able to slide right by. The Mariners are working on a new style of baseball. Hit the ball as little as possible, never score any runs and that way, when they do score and they do pull out a win, it's by the skin of their teeth and they can dance around the field and celebrate as if they won the World Series. John Jaso got the Mariners on the board in the 6th inning with a bases loaded double that scored two. Jaso has been on a spree of hitting in clutch situations and he has to be becoming a fan favorite. The Red Sox got the two right back in the top of the 7th when Brandon League took over for Lucas Luetge after a lead off single from Adrian Gonzales. Luetge pitched a scoreless 6th inning but was charged for a run when League came in and totally Leagued it. He gave up a single to Will Middlebrooks and another to Cody Ross. With nobody out and the bases loaded, Ryan Kalish grounded into a force out that scored Gonzales and then Olivo was charged with a passed ball to score Middlebrooks and the game was tied. League was charged with a blown save. The Mariners had only one hit through the first five innings, and after a day when Manager Eric Wedge laid into the team for their lack of hitting, it didn't seem to be helping at all. Olivo had the M's first hit in the 5th inning and then, the 6th - the 11th they tacked on another 8 hits and supplied a total of 3 runs. The hero of the game, Chone Figgins, he went 0 for 4 on the night with 2 strikeouts. Very heroic! Erasmo Ramirez left the game in the 3rd inning with something wrong with his right elbow. The second time in three games that the M's have had someone leave the game with an injury. It's definitely not a bad thing when the Mariners take two of the first three games against a hot Red Sox team, but the team still has to dig deep to find better results in the hitting department. There has got to be more... right?